For each of your [R] Pokémon in play, put a card from your opponent’s discard pile in the Lost Zone. This would be SUPER broken if Lost World got reprinted. 1) You need [R] Types in play to remove anything. 2) To win using JUST Lysandre [Prism Star] and Lost World, you’ll need six [R] Pokémon on your side of the field. That means there’s no room for stuff like Tapu Lele-GX. 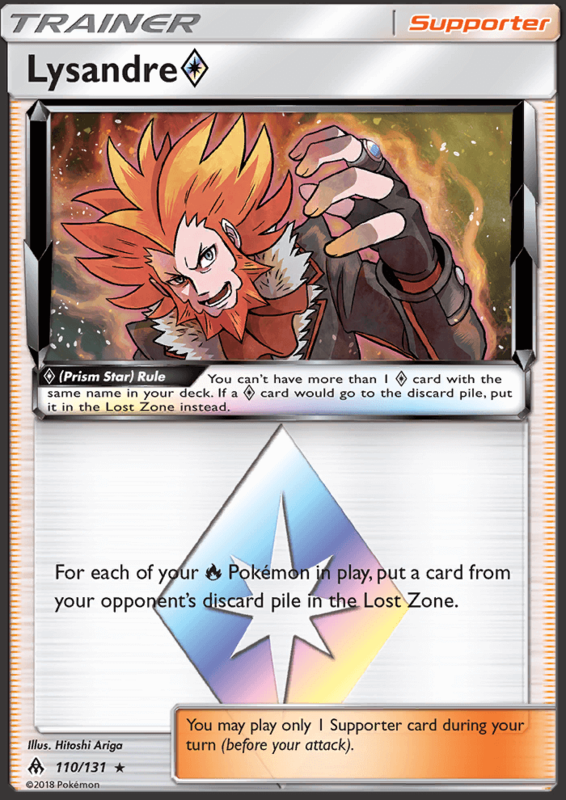 3) You are allows ONE copy of Lysandre [Prism Star] AND it sends itself to the Lost Zone if it hits the discard pile for ANY reason.